Woodcarving remains one of the most popular crafts in the U.S. and continues to grow in popularity. 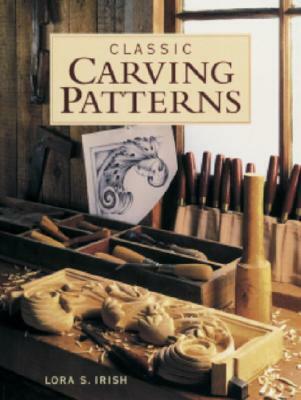 While there are many books on how to carve wood, including Taunton's popular How to Carve Wood (1985), this book provides inspiration for carvers through original patterns. Any carver knows that once the technique is mastered, the greatest challenge is finding clear, well-illustrated designs to carve. This book solves that problem by offering a wide variety of carefully detailed drawings of designs especially suited to carving. Trained in European carving and drawing techniques, artist/author Lora Irish presents an extensive library of ornamental designs with a traditional look. Included here are classic ornamental motifs from 18th century and other period furniture as well as original designs by the author. The motifs include line designs, triangular designs, square and rectangular designs, circular and oval designs, S- and C-curve designs, mirror-image designs, and free-form designs. The book can be used in number of ways: The drawings can be adapted to the carver's preference or used directly as patterns, easily enlarged by photocopying and transferred directly to the wood to be carved. The patterns can also be used in other woodcrafts including woodburning and woodpainting. Author Name: Irish, Susan S.